This looks really good, really really good. 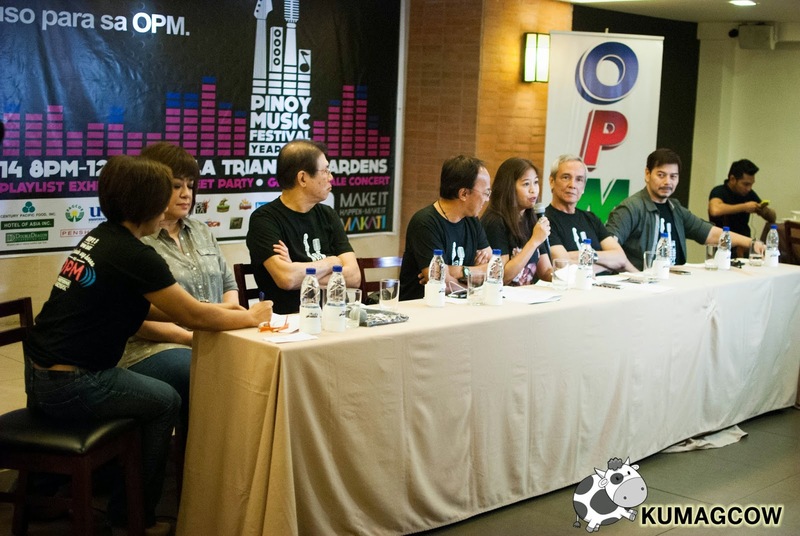 There's news that the first Pinoy Music Festival will happen in Makati but we just confirmed today that it will happen from 8pm - 12am at the Ayala Triangle Gardens on September 5, 2014. This will only happen in one day, best of all, it's free. Artists, Composers, Musicians and the talented Youth will joint forces to showcase the best of the best in original Filipino music. Johnson and Johnson, makers of Bactidol will be one of the sponsors, and they signed the memorandum of agreement this afternoon. Ms. Tina represented them and says "Together, we will strive to commit in helping more and patronize music, artists, composers and musicians in the country." Nonoy Tan also adds in the statement, "In behalf of Filipino Composers, we fully support this cause!". Jim Paredes of the APO Hiking Society shares that "The importance of OPM in the Philippines is slowly being realized. To be international, one must be in a local setting; and in the context of Filipino. We should focus in being crazy about our music and the world will automatically notice us." Jong Cuenco, representing musicians says "We hope not only singers, artists help this cause but also musicians. This will benefit us all and the music industry. "Alvin De Vera of PARI, says he wants to "Enjoin labels and those who love Filipino music continue to purchase only legal copies and adds they will also support this event and possibly the future ones as well".Tippy Dos Santos and Abra who represents the young recording artists sternly supports the Pinoy Music Festival and the other causes the OPM is pushing, they want to assure that they'll all be at their back supporting new projects and upcoming artists as well. We talked to Noel Cabangon, one of the Philippine's most celebrated folk singer and composer and asked about the matters they're raising to the government and found quite sound statements. He's humbled that President PNOY mentioned him and Ogie as his favorite singers in the last SONA and he hopes that it somehow would be able to at least get them heads way in pushing for an executive order to officially make a "Linggo Ng Musikang Pilipino" (Filipino Music Week) next year, either July or September because that's where we got less festivals. It's what they're asking the government to support - to further their cause and make it one of the biggest, perhaps even make it a tourist attraction or something that the international community would notice when it comes. We have the hardware he says, as Filipinos have some of the greatest singers in the world. This might take long but he's hopeful that the President would at least take a look at this cause. PAGCOR is already supporting them but they've been talking to the agencies so they can get that approved. They are ready to submit it and the office of the President is keen on seeing it, they are hopeful that it'll happen real soon. It's going to be very big and will be "National" in scale and they want all major cities to simultaneously celebrate it. One in Luzon, Visayas and Mindanao... then Manila to culminate it. They are also hoping it to be something that other countries could also see as something unique in the Philippines, they're hoping to start it in Metro Manila first... perhaps the cities would be able to do it in their turfs. Other than that, they are planning to make this ready for integration on 2016 for ASEAN and see exchanges in other countries more rich, since we have it all. Ms. Mitch Valdez was there to support his compatriot Mr. Noel Cabangon and his project with PhilisCaP, an organization for composers and OPM. Board members are supporting this as well, together with PARI and industry movers as well. As for the government, Ms. Mitch Valdez says it's very difficult to expect help from the government and its agencies. They better do it on their own, especially now that they have financial issues hitting the country. Organizations like them used to exist with government grants, but not today. They need funding, and the only venues they go to are from fund raising events. She adds there is little empathy about the causes of this industry who don't even think that there are people behind one artist or one song that won't be able to live alone on royalties. They are hoping for the public to take action, to patronize the arts and maybe in the future to see what the culture in the sense would get their identity in original Filipino music. There's no middle ground now, they are trying to support families and that's one of the reasons why everybody else is going out of the country. The ones who remain are trying to do something about it, like Ogie and Noel. They would be only to measure success in events like these because there's going to be free music and she hopes the message comes across when they listen to it. Abra and the youth representatives also showed their talents during the press conference and they hope that there will be an even brighter future for the industry. They showed that right in front of the industry greats and people like Noel Cabangon, Jim Paredes and other leaders; they heard pretty good music. Abra is simply one of the best. For those who would want to join them on September 5th, be at the Ayala Triangle Gardens at 8PM and see how original Filipino music can make you once more an even greater believer than you once were. Bring your friends, your family and everyone else because of course, it's all free!